Pediatric Home Health: What Does an In-Home Nurse Actually DO? Due to my daughter Elizabeth’s complex medical needs, she has a pediatric home health nurse. People are very curious about this. What does the nurse do? What is it like having someone in your house all the time? Usually, people are surprised by my answers, but the reality is that our nurses become like family. There’s a lot of misconception about Pediatric Home Health. I hear from both special needs and non-special needs families that they think having an in-home nurse means that the mom can’t or isn’t taking care of the child anymore. A home health nurse doesn’t take the place of mom. She comes alongside and HELPS mom. I hear, “Well, I’d rather take care of my child myself than someone else.” A home health nurse doesn’t take the place of mom. She comes alongside and HELPS mom. I am still Elizabeth’s mom and I still raise her and do a lot of her care. I make the decisions and I speak with the doctors, but it’s also nice to have a nurse there to help, assess, and give me times where I can take a break. I also hear a lot of jealousy at times from fellow moms. 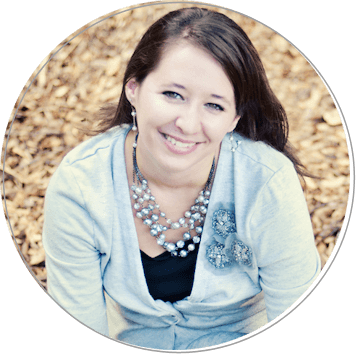 I’ve had people say things like, “Wow, that must be nice.” or “You’re so lucky!” and “I wish I my kids had a nurse!” These words can be very hurtful because it shows how little people know and understand about pediatric home health. All I can think when I hear things like that is that people need to remember that no, I am not “lucky,” they are the lucky ones because their kids are healthy enough to not need an in-home nurse. Our nurse has seen the best and worst of my family. I’ve cried on her shoulder, I’ve talked over huge decisions with her, and I trust her more than any other person with medical training. We are so blessed to have her and are much better for having her in our lives. So what does a home health nurse do? The tasks may vary from family to family and each nurse is a bit different as well as each patient. Here is a list of tasks that most nurses do as part of their job in their patient’s home. What does a home health nurse do? Here are just a few of the tasks they do in a patient’s home. Keep the feedings on schedule and deal with any beeping and pump errors. Clean bottles, air dry, and put away. Check stoma (G-Tube site) and clean. Check water amount in the G-Tube balloon once per week. Change out G-Button every three months. Clean feeding pump and backpack. Change out extension once per week. Manage and give all medications. Clean all syringes and medicine cups. Air dry and put away. Have all medications ready to go if we are traveling. Call in medication refills as needed. Document any medicine changes or new side effects. Check medical supplies for G/GJ-Tube and oxygen. Order new supplies for G-Tube once per month. Order new supplies for oxygen once per month. Organize and fill up supplies as needed. Help keep a go-bag stocked with supplies. Check to make sure there are enough diapers and wipes. Change out oxygen tubing every two weeks. Wash filter on oxygen compressor, air dry, and put back. Make sure oxygen is always at right levels, is still working, and no kinks or holes in the tubing. Work on Occupational Therapy techniques per therapist. Doing “heavy work” activities for sensory needs. Work on Physical Therapy techniques per therapist. Work on Feeding Therapy techniques per therapist. Allow time for oral attempts to eat and working on trying to get patient to try different foods. Work on Speech Therapy techniques per therapist. Work on any other therapy techniques per therapists. Give a bath every day or every other day. Check diaper every few hours or take to the bathroom. Check vitals (oxygen, heart rate, oxygen level, respiratory and lungs, and blood pressure). Assess patient’s health, and assess when the patient needs to see a doctor or go to the hospital. Clean any dishes, cups, or silverware that patient uses. Running loads of patient’s laundry. Hang, fold, and put away patient’s clean laundry. Clean up or help patient clean up toys. Organize clothes and clean patient’s room. Change sheets and comforter as needed. Clean and wipe down medical bed after spills or leaks. Empty diaper genie when full. Clean and refill patient’s humidifier. Attend all doctor appointments during a shift. Attend all therapy appointments during a shift. Keep medical paperwork and folder organized and updated. Help fill out medical paperwork. Call pediatrician to get referrals renewed. Call doctors as questions or problems arise. Help organize medical care between doctors, case manager, and insurance. Make/cancel appointments with doctors, specialists, and therapists as needed. I hope this helps many to see and understand what a pediatric home health nurse actually does. Many days I do some of the tasks above, other days I let the nurse do it. It just depends on what’s going on and how busy my day is. Again, many of these tasks vary depending on the child and their health issues are. Some nurses come at night while others come during the day so their tasks will vary based on that. 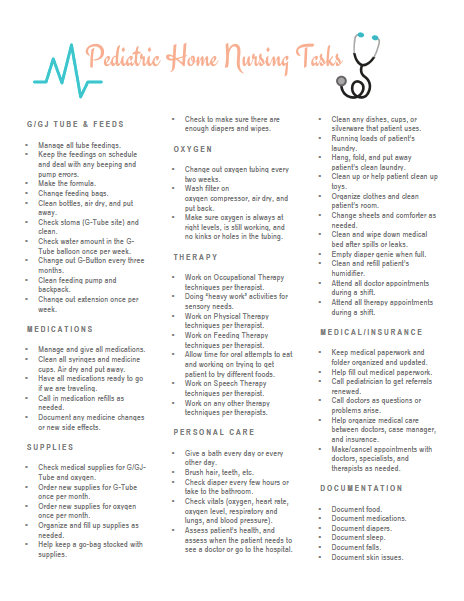 Since so many people asked, I created a printable of the nursing tasks for families to use at home. Just click on the image and it will bring you to the printable version! What about YOU? Has your child ever needed a home health nurse? Would you ever get one for your child? Safety- my son had uncontrollably seizure with emergency meds. Safety again- my son is hypoglycemic, if his 24,hour feed stops he drops his blood sugar quickly! He has emergency plan with meds. Nursing tasks- just to add to the tasks above he has an ileostomy! And is at risk for skin breakdown and dehydration. Nursing task- he is a total quadruple so he has skilled transfers with ceiling lifts. Well yes, like I said every situation is different. My daughter also has three genetic diagnoses which require skilled nursing. Ehlers-Danlos, Dysautonomia, and Mastocytosis. These require a lot more than what I listed here, but the tasks above are the basic things a nurse does. We are very blessed to have our nurse! When my medically complex son was a baby, I definitely could’ve used a home nurse. He was incredibly difficult to care for, and I had to basically neglect my other children to do so (they were 6,3, and 17 months old when he was born.) He had severe sensory issues and couldn’t handle them being near him most of the time, but needed my full attention. I thought about looking into it, but I don’t know if it would have helped much as most of the time I was the only person who could calm him down. He’s 3 now and doing amazingly well. We recently got PCA services for him and 2 of my other kids who have Ehlers Danlos Syndrome like him and it’s been amazing having help taking care of their needs. My sisters split our PCA time between them. Hi Hannah! What’s PCA? Also, I don’t know if you remember or not, but I messaged you awhile ago asking some questions about Ehlers Danlos because I thought my daughter might have it. My daughter was officially diagnosed with it a few months ago. A PCA is a Personal Care Assistant. They’re much more limited in their responsibilities than a home health nurse, but it’s been VERY helpful to have them. My EDS has progressed to the point where I’m not longer able to do all the cares for my kids. I remember you asking me about it! I didn’t realize she’d been formally diagnosed. What type does she have? My niece is a pediatric nurse. In addition to many of the above, she also goes to school with her client. I am a home health nurse. In addition to everything mentioned in the article, and the comments regarding seizure and brittle diabetes management, my colleagues and I can provide wound care and dressings, G tube changes, IVs and central lines, including IV meds, plus respiratory therapy and management, including vents, trachs, and trach changes. We basically can provide PICU level care at home if it let’s a severely ill child live at home, instead of in the hospital. I was very surprised to see such a short list of simple care needs. Depending on the needs of our clients, we sometimes care for kids so medically complex that if they do need a trip to the emergency department or hospital, we go with them because hospital staff don’t even know where to start. Of course nurses can do TONS of things medically-wise. This is a simple list of HOME care duties unrelated to significant medical conditions. A nurse is there for the medical, but I made a list of home duties because sometimes it seems that at home there is less to do, and that is not true. My daughter is very rare and medically complex and she requires many many things you mentioned, but that is just included in the entirety of “nursing” the other tasks that I have listed are extra.